Purchase the Premium Pack in the game to get a bonus Mystical Scroll! The [Premium Pack Event] is back once again! ★This event is available for limited time only★, so check out the [Premium Pack Event] now. - Purchase 1 Premium Pack during the event to get 1 bonus Mystical Scroll! * Tap [Shop] Menu> [Special]> Purchase the [Premium Pack] to get 1 bonus Mystical Scroll. * The bonus scroll will be sent to the Inbox upon purchase. 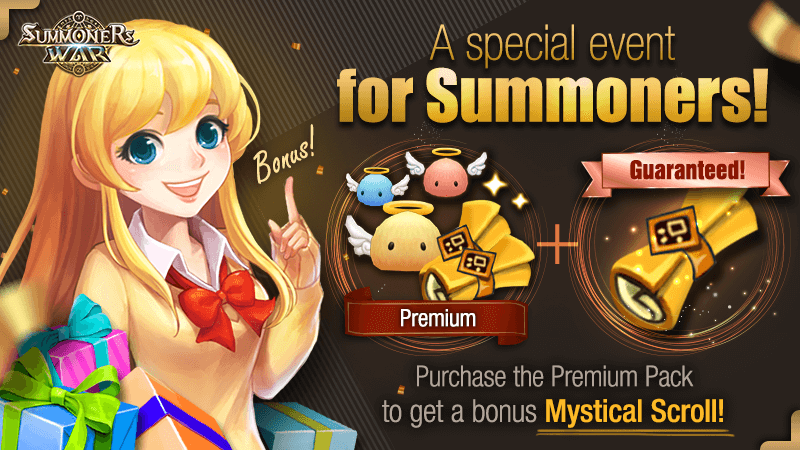 - Bonus Mystical Scrolls will be given regardless of the number of purchases during the event. - Items will be instantly sent to the Inbox upon purchase. - Please restart the game if you're playing when the event begins to avoid any delays.